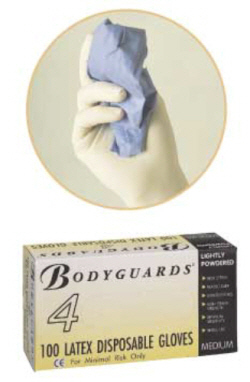 Boxes of 100 Bodyguard large Latex Gloves. Lighlty powdered to aid donning, for the protection of the users hands against dirt and light contamination in applications where a high degree of dexterity and sensitivity is desirable. CE for minimal risk manufactured to BS EN 420. Also available in Small, Medium and Extra Large.